Why is this important? Because the active area on one of these tablets is mapped to match your screen layout. What I mean is that if you tap in the top left corner of the active area, your mouse will go to the top left corner of the screen. The same is true for all the other corners, as well as any point onscreen. So, the upshot of this is that while the active area might be massive, if your working area onscreen is less than the whole screen, then you won’t get to use the whole active area as that working area. That’s why I’ve created the diagram to roughly show you how much screen and active area space the toolbar, taskbar, and all the different tool windows take up. I’ve actually made two version of the diagram, one based on Gimp and one based on Photoshop. 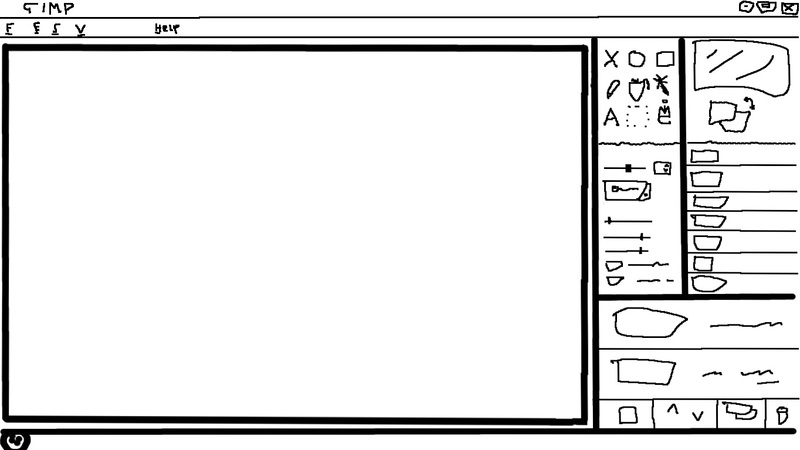 Then I’ve created a document, available as a .doc or .pdf, which contains the diagram at 5 set sizes to represent the majority of the Wacom tablets. They cover the Bamboo Pen, Pen & Touch, Manga, and Fun Pen & Touch, as well as the Intuos4 or Intous5 in Small, Medium or Large (large doesn’t quite fit on the A4 page, but it’s mostly there). Each page also has what tablet that page represents and its active area dimensions . So, all you have to do is choose your diagram type, your preferred format, and print it. I really hope you like it, and that it helps you out. Feel free to leave me a comment below or repost this somewhere (but tell me first, please). Nice website over here! I’ll just wanna thank you for that.